As the Islamic State continued its march of destruction across Iraq and Syria, ten Ministers from Middle East and Northern Africa countries joined together at the Cairo Conference on May 13-14 to announce an action plan in the fight against culture under threat. The issuance of the Cairo Declaration, the first communiqué of its kind in historic preservation, commits these ten countries to specific actions that will help protect and preserve their priceless artifacts as well as raise awareness globally about the plight of conflict antiquities. 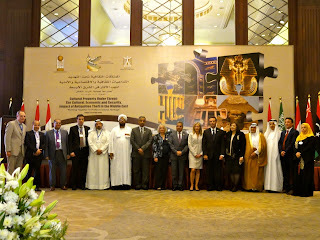 The Arab State of Egypt hosted this event as part of its critical campaign in the fight against religious extremism. The Antiquities Coalition is proud to be a partner in this initiative. During the opening remarks, the four conference sponsors emphasized the urgent nature of the threat, and called for swift action. Irina Bokova, Secretary General of UNESCO, called these attacks against heritage “a Crime of War.” Egyptian Minister of Antiquities Mahmoud el-Damaty highlighted the organized aspects of the antiquities looting and how Egypt had suffered since the January 2011 revolution. Over twenty leading experts from heritage law, counter terrorism, law enforcement, archaeology international organizations, and regional specialists also participated to share their experiences with the Ministers and their delegations. General themes emerged from the discussions with the experts and countries. · Regional approach: countries agreed on the need to address the threat as a region, not just as individual countries. · More than war zones: the crisis extends beyond Iraq/Syria to most of the countries in attendance. Solutions need to address those not just in immediate crisis, but also under attack by criminal organizations and cultural racketeers. · Awareness raising: public awareness campaigns should be launched. Internationally, to link purchases of illicit antiquities from the region to terrorist financing and in Cairo Conference countries to help the local communities understand the importance of protecting heritage, especially training for children. · Use of international and domestic law: several countries voiced concern about the provisions of existing law to address heritage protection in times of crisis. While there was no consensus around calls for a new international convention, there was general agreement that the international provisions need to be strengthened and clarified to find ways to better help countries facing a crisis in heritage. A task force is being established immediately to being implementation of this historic agreement. The Antiquities Coalition and its partners will be an important collaborator in this effort.